Something strange is going on in Ambrosia and Jason Whittaker lands smack in the middle of it. His car horn beeps on its own, the radio plays by itself, and the vehicle careens wildly out of control. Things are just as haywire at the Last Chance Diner, where the silverware suddenly moves across the table! The Last Chance Detectives jump on the case, but the mystery deepens after Jason mysteriously vanishes. 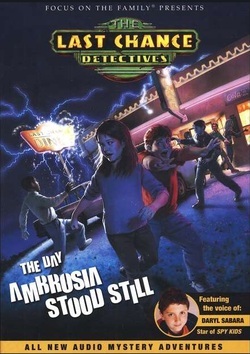 The Day Ambrosia Stood Still is a twist-filled whodunit that explores greed, corruption and other hazards of gambling. When the Last Chance Detectives radio series was airing on the radio, this commercial for Audio Case #1 was aired with it.